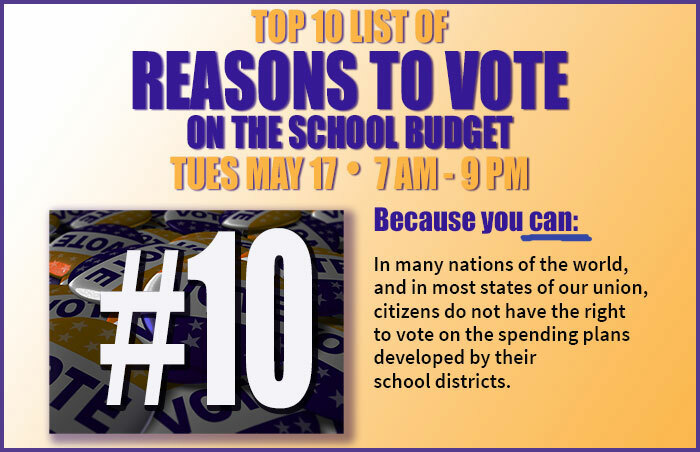 Here are the Top 10 Reasons to vote on the school budget on Tues., May 17…. The folk wisdom that “it takes a whole community to raise a child” fits here. You share the responsibility to see that all children are educated. While you may not be actually involved with what occurs in your district’s classrooms, you can make your opinion known on what happens there by voting. Elections are often decided by only a few votes. In the case of low voter turnout, a minority of the residents can determine the entire district’s future. Public schools educate by far the greatest number of our next generation – those to whom we will one day turn over the reins of government and business, and those who will care for our generation as we get older. Of all levels of government, only public schools and libraries provide constituents the right to vote on their budgets. Your Board of Education members are elected concurrently with the budget vote. School boards set policy and goals for your district, and select your district’s superintendent. They represent your educational interests. You get to decide each year on the quantity and quality of educational programs and services provided in your community. Children notice whether or not the adults in their lives exercise their civic responsibilities. We set an example for them whether we vote or not. 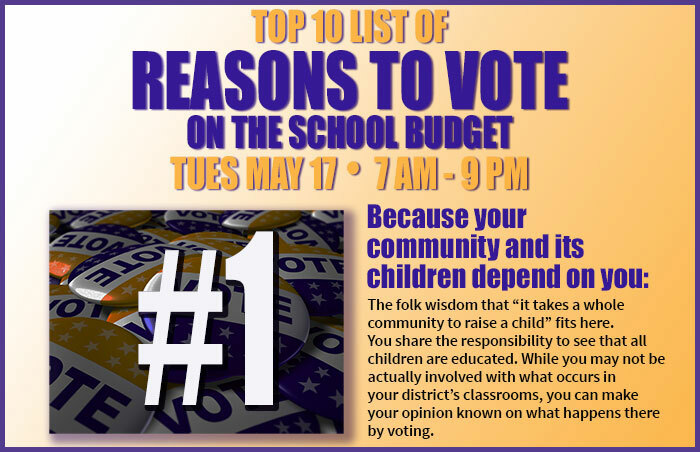 There are some people in every school district who vote for reasons other than yours. If you don’t vote for what you believe in, others will – and you might not like the outcome. Since all of us have the right and responsibility to vote on our district budgets, you too are accountable for exercising your civic duty. In many nations of the world, and in most states of our union, citizens do not have the right to vote on the spending plans developed by their school districts.